The delivery for all 8 DYS 1806 2300kv brushless motors took some time. Equiped with a Gemfan 5030 prop I should reach a 3 on 1 Trust to weight ratio. Next step is connecting the clean (vibration free) housing with all electronics (flight controller, telemetry, fpv) to the octo frame. The installation of the electronic parts continues. I have made a PCB on which I inserted the OSD an VTX. This to avoid a bunch of cables that is needed to interconnect these modules with each other and other the components (cam, power, apm). This PCB groups the OSD en VTX into one module with 3 external connectors. The FPV camera is mounted to the frame just by tape. This was the easiest and fasted option. In this setup I tried to maximize the distance (22cm) between the FPV 5.8ghz antenna and the Wifi 2.4ghz antenna to avoid interference. On one of my previous projects I had only 12cm distance which added some noise on the video signal. 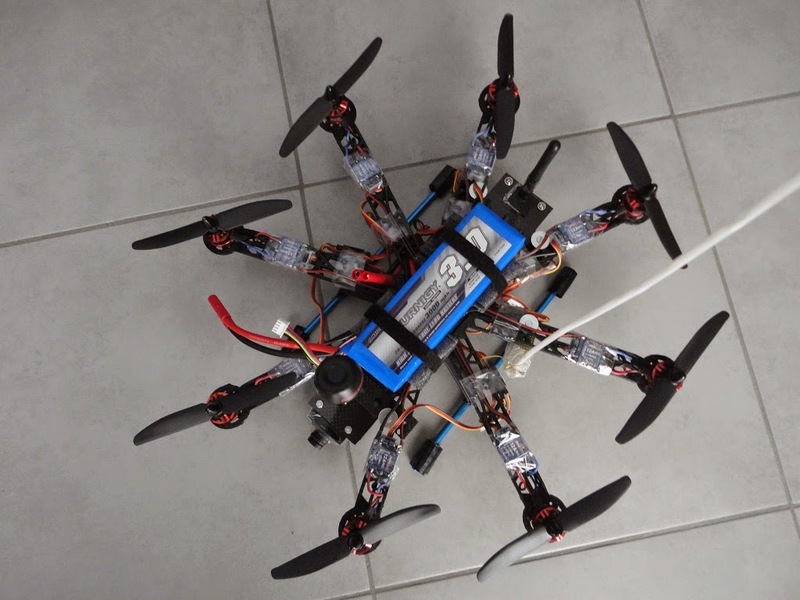 I should go for an 1806 or 2204 -> 2300kv motor to reach a powerfull 3 on 1 thrust to weight ratio. 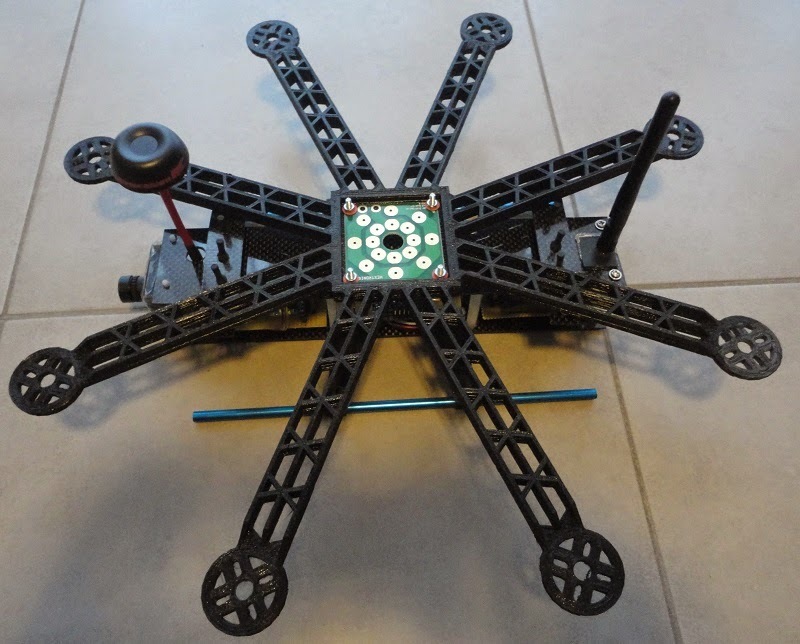 A quick status update on the FPV 250 Style octocopter I'm currently building. 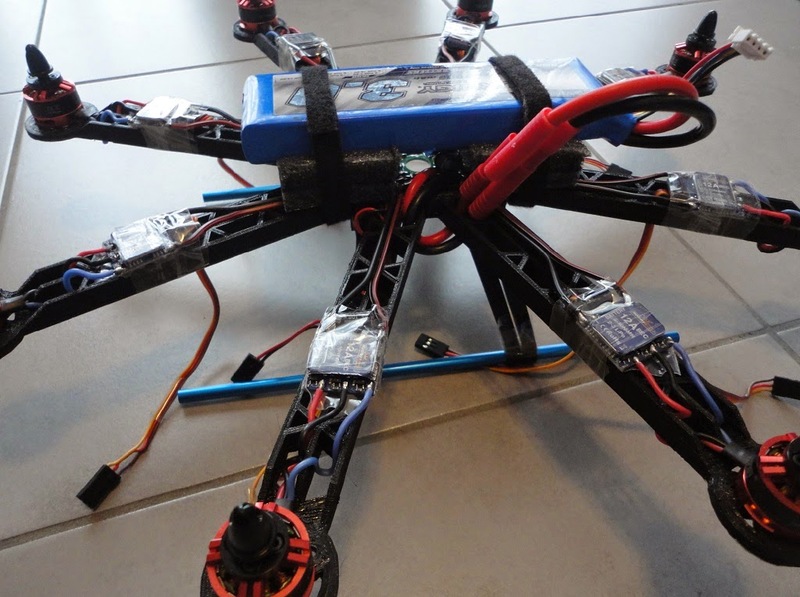 All Power hungry electronics are mounted on top of the octocopter. PDB (power distribution board) mounted on top in the center of the frame. Battery will be mounted on top of this PDB. ESC en motors will also be mounted on top of the arm. 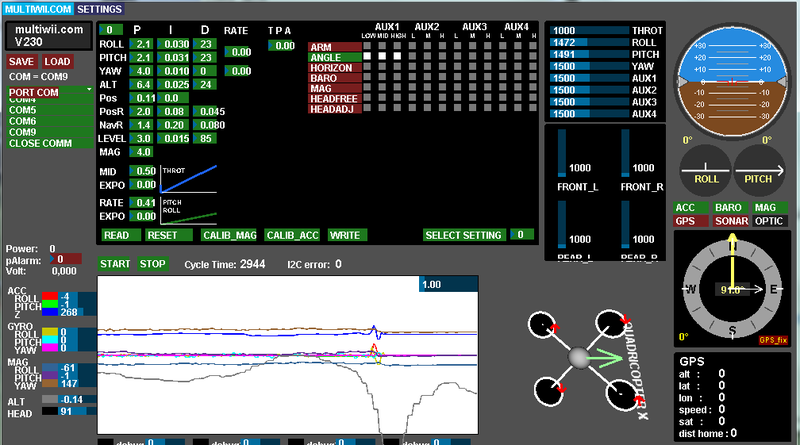 This will maximize the distance between the FC boards magnetometer and the EMF caused by high currents (MOTOR/ESC/BATT). Weight is building up. 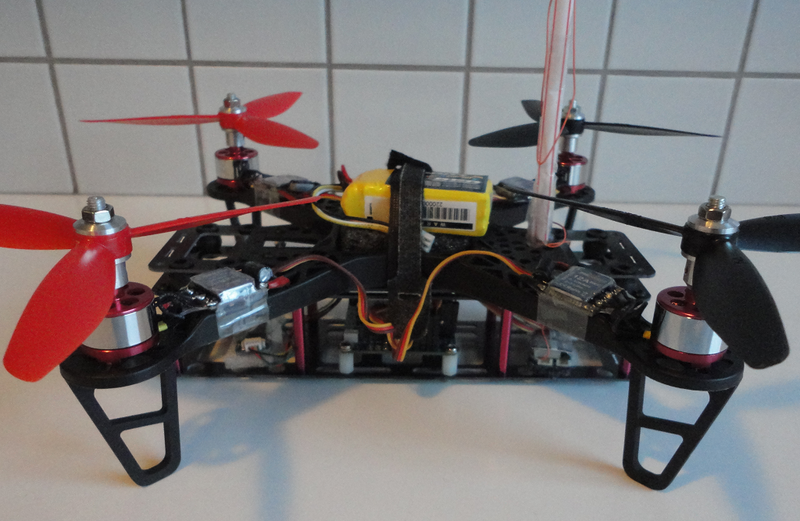 When I would use 15gr brushless outrunners with 6a ESC and a 3000mAh 3cell Lipo I'll end up at 950-1000grams AUW. Depending on the performance of the motor I would get a trust to weight ratio somewhere between 2:1 and 2.5:1. My next project is a small OCTO copter. Why? 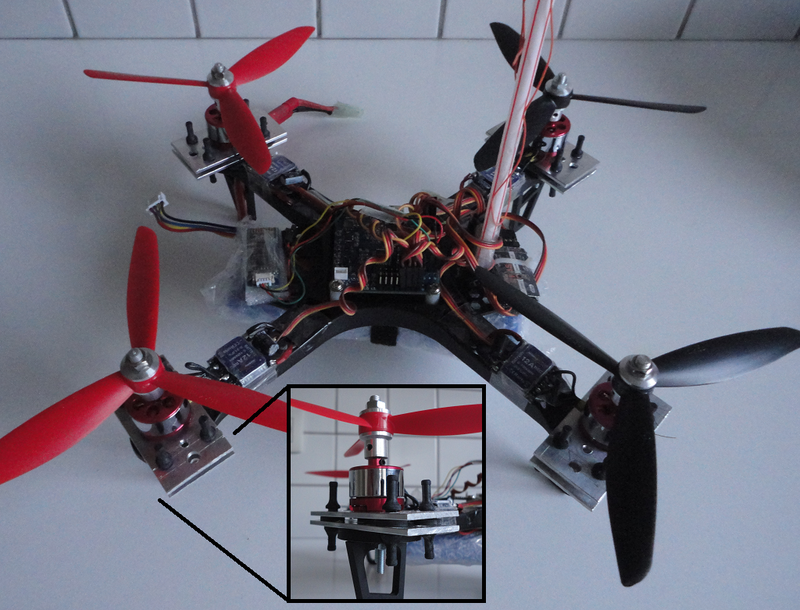 Because I would like to have a multirotor that is able to continue flight when one engine fails. For this purpose I already had started my Y6 project. But I did not really like the way a Y6 flies. A Y6 is pitch sensitive when you change yaw. A second factor is the efficiency loss on the bottom motor/prop. A the last factor to discontinue my Y6 project was the size of it. I found it to be to large to fly in my backyard. So a new project is born. 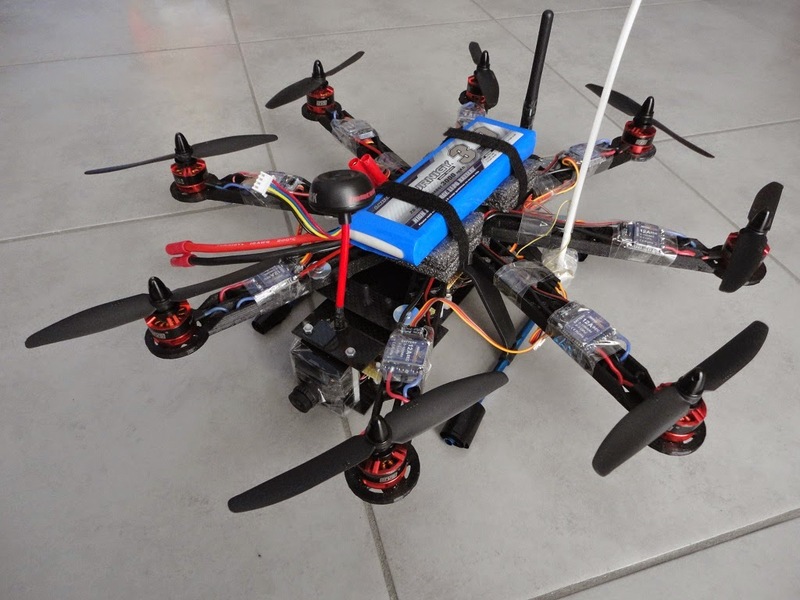 This is HK FPV 250 style OCTO-Copter. This octo frame is 3D printed with PLA and weighs only 135 grams. Motor to motor distance is 36cm. 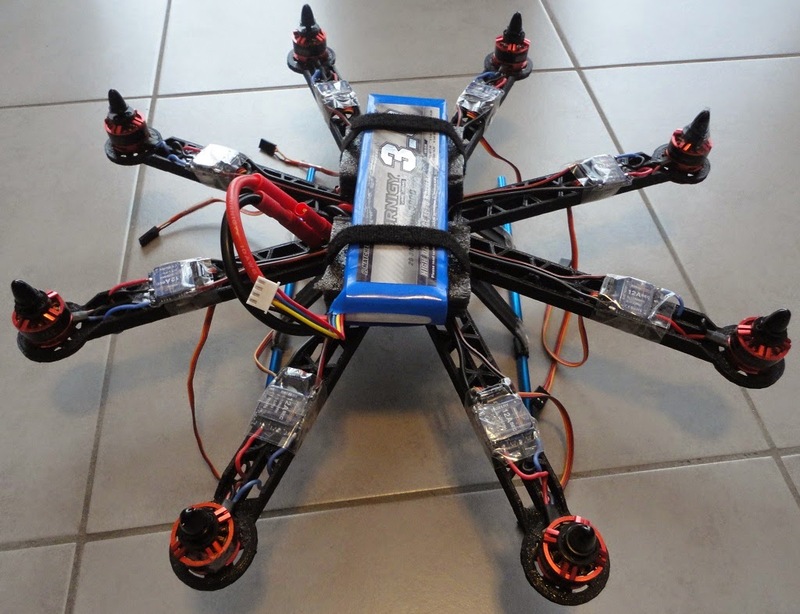 To goal is to mount the HK FPV 250 low hung kit on this frame with all electronics inside. Depending on the weight I will then choose a motor/esc/battery combination. Maximum prop size on this frame is 5 inch. 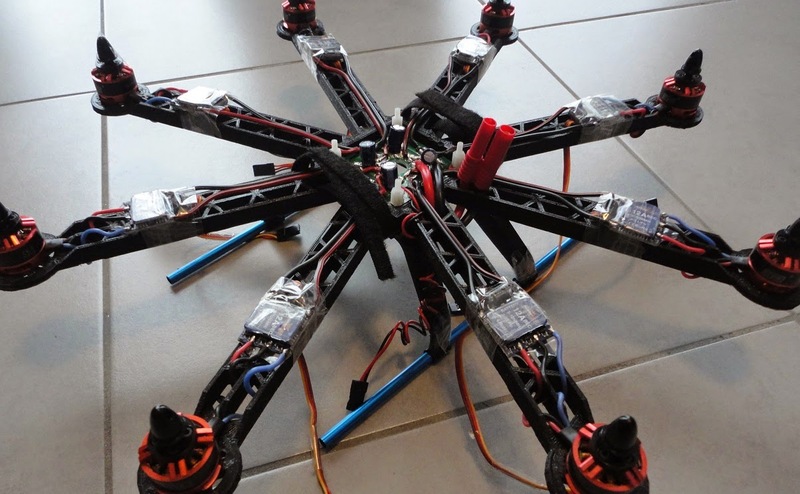 This is FPV250 low hung frame equiped with a fatshark fpv camera set. The fpv camera is mounted in the clean section of this frame. As I noticed in my previous vibration test the low hung frame performs very well on reducing vibrations. And this has a huge (positive) effect on image quality. The movie speaks for itself. Just watch it. The HobbyKing "low hung clean and dirty kit" is created to reduce vibrations on fpv camera. This frame divides the quad in 2 parts. An upper deck that is dirty (vibrations) and a lower deck that is clean (no vibrations). It is still the same setup. Same unbalenced props and motors. All power equipment (motors, esc, power distributor, battery) are mounted upper deck in the dirty part of this frame. 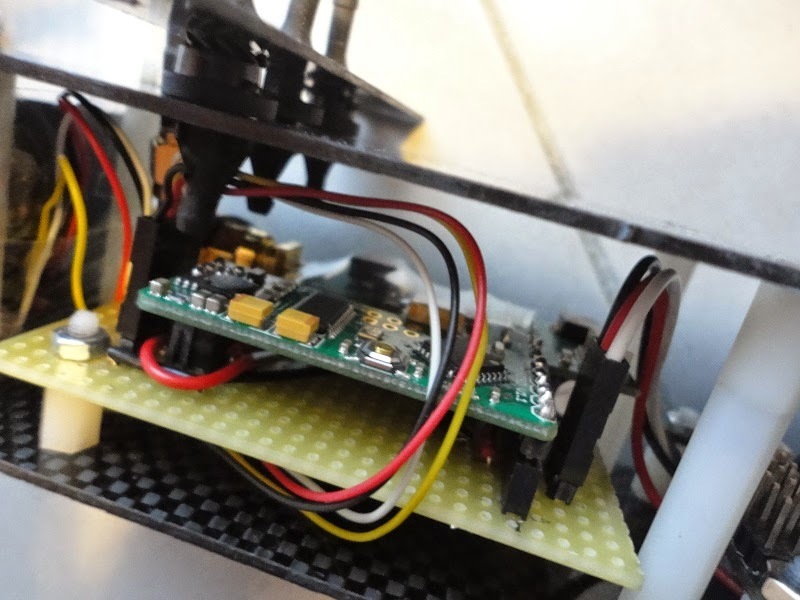 The Flight controller bluetooth and receiver are mounted lower deck on the clean part. 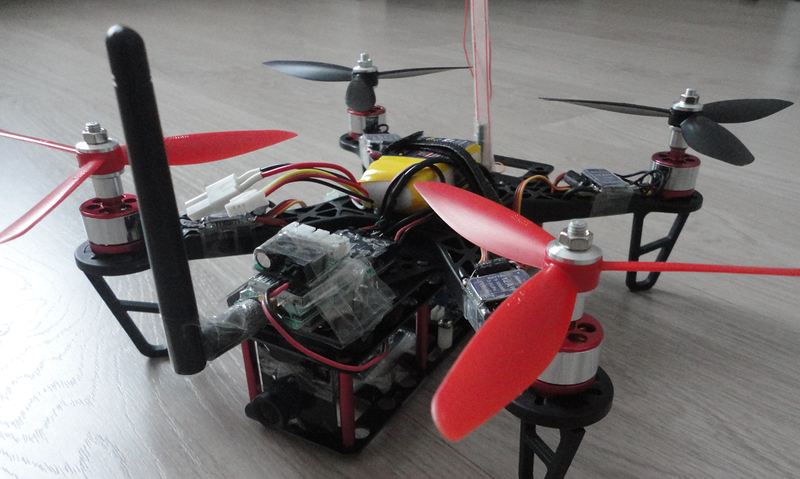 For this benchmark I don't mount any FPV gear yet. As you can see the results are really good. 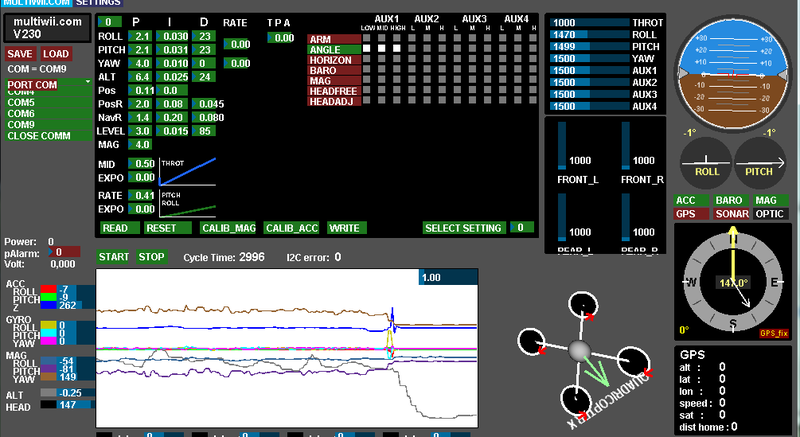 ACC an GYRO values (graph) are flat. This means that the clean kit is really clean and has no vibration issues. This should improve image quality or remove jello effect on a FPV cam. Even the MAG values are now a flat line. This is the result of mounting the flight controller lower deck. This makes the distance between the magnemoter and motors/esc larger and thus reducing the interference caused by EMF (high current). In my first quadcopter project I already introduced some cheap and easy to build motor mounts that reduce vibration almost completely. Downside of these motors mounts is the fact that they add 95 grams of weight to my little quad. But it really kills the vibration and the quad is flying super smooth. No shaking, no aggressive corrections, no wobble. because my setup has a bluetooth module I can connect my laptop over bleutooth to my quad during flight and have live telemetry. Vibrations caused by motors and prop have influence on gyro and acc values. When hovering in air these gyro en acc values should produce a nearly flat line. As you can see on my screenshot this is not case. 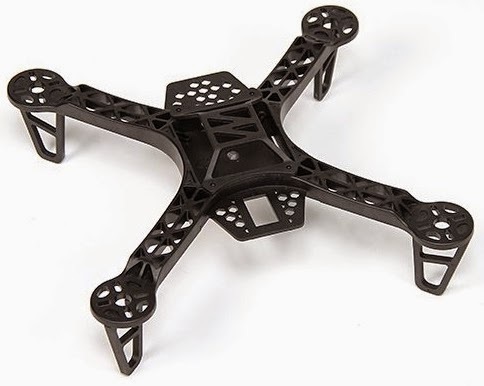 The Hobbyking FPV250 multirotor frame is a very popular frame. Because it is light, strong and cheap. Currently this frame comes in 3 flavors. This is the basic and original model of this frame. 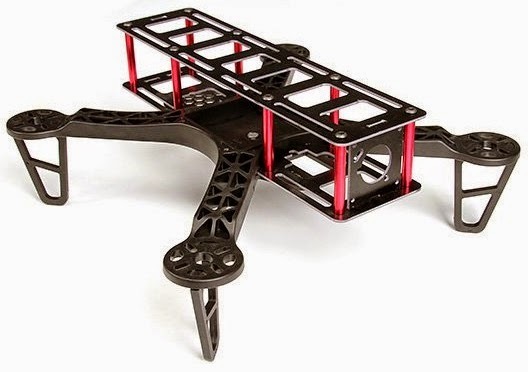 Allthough it was originale designed as an FPV capable frame I advice not to use it as an FPV frame unless your motor and props are high quality and 100% balanced. It's small, light and ideal for flying in your backyard or a nearby park. 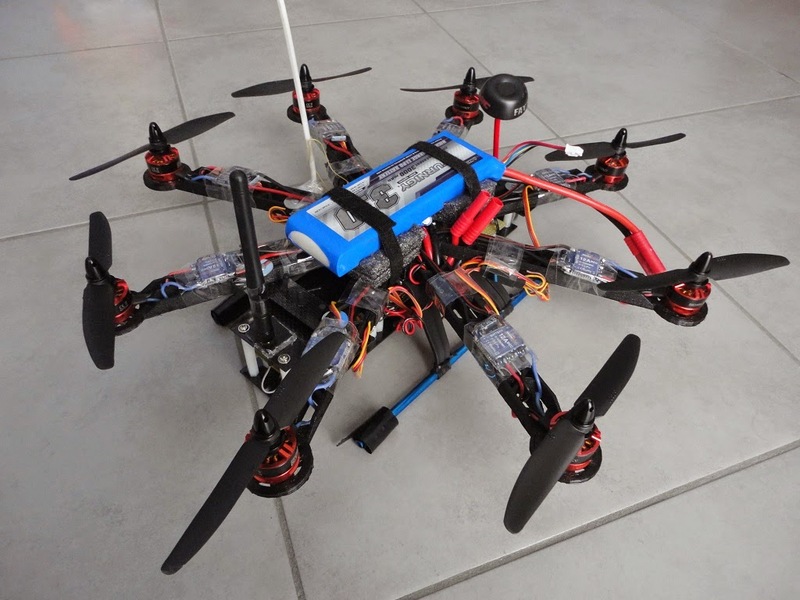 The long frame model was made to provide FPV users more space to mount there FPV camera, transmitter and even a second HD camera for recording. 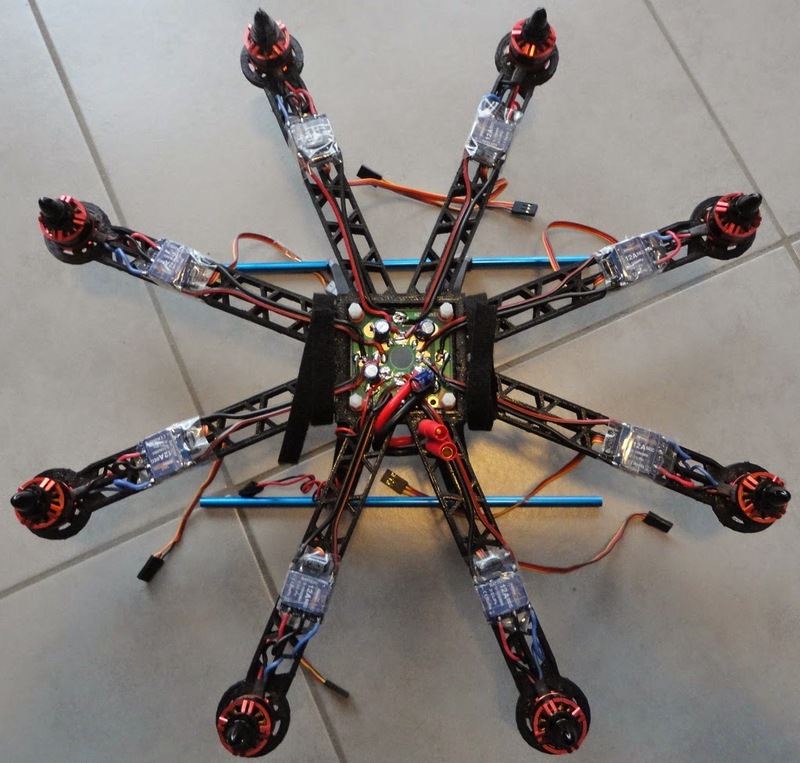 But you still need HQ, well balanced props and motors if you don't want to have that jello effect on your fpv cameras. 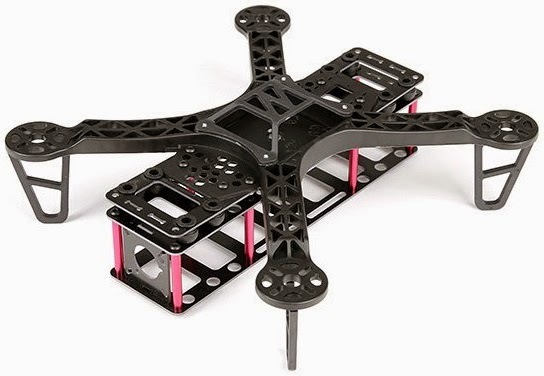 The downside of this extension is that you can only mount 5 inch props, whereas 6 inch props could be mounted on the original frame wich makes the basic frame much more efficient. The 3e frame that HK released takes the benifites of the 2﻿ previous frames. 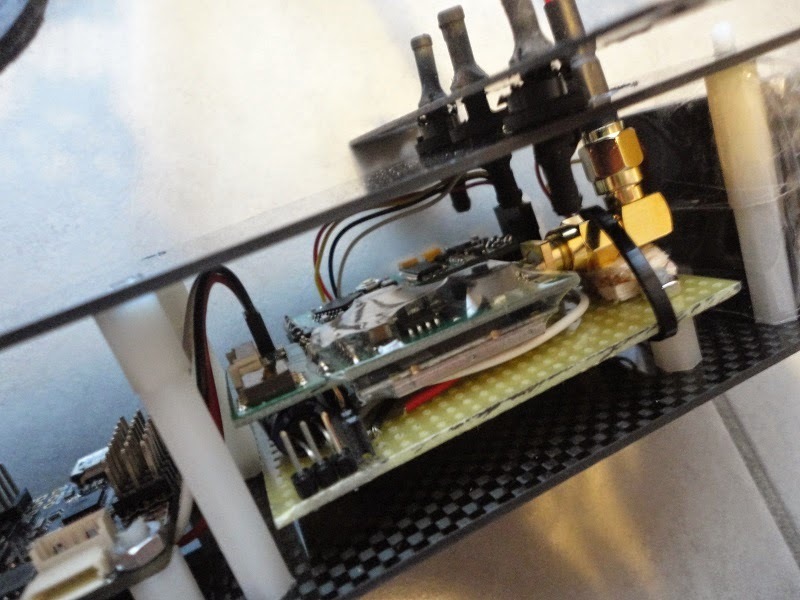 The long extension provides lots of room to mount all FPV gear and because it mounted on the bottom you can still mount 6 inch props making this an efficient frame. The extension is also attached to the frame by rubbers. HK calls this Clean-and-Dirty Kit. This should prevent jello effect cuased by vibration of motors and props. 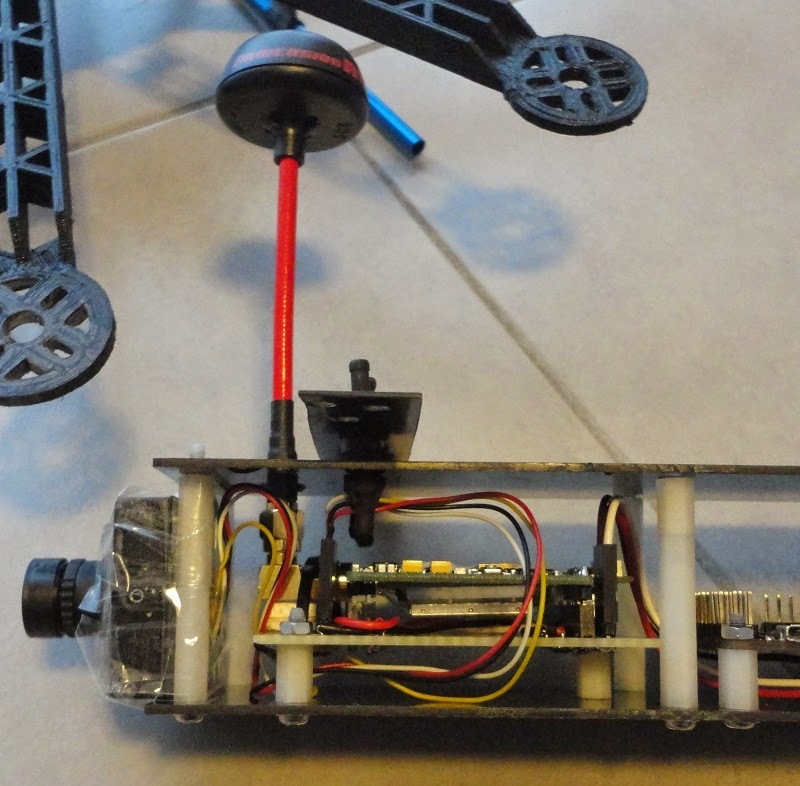 In this blog I will investigate the vibration issue caused by motors and props. 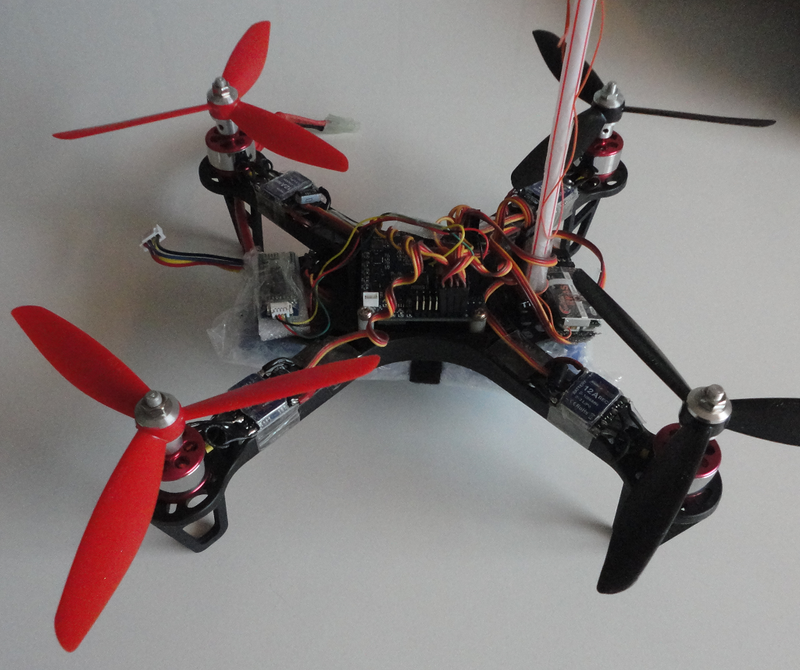 I'll compare the basic frame with the low hung frame with live telemetry output from the flight control board.